Your credit card is charged when we ship — and not before. Every online order we receive is confirmed by email. In-stock items are usually shipped the same day an order comes in; out-of-stock items are shipped as soon as they arrive in the store. If the shipping cost seems excessive to us, or needs to be adjusted, we will contact you to confirm your delivery-method choice, and to discuss alternatives. If speed is an issue, please contact us — we’ll find the fastest and most economical way of getting you your package. We recommend shipping by Canpar ground courier, which is cost-effective and reliable. In central Canada, Canpar parcels are delivered the day after we ship. Delivery to the East or West coasts takes four to eight business days. Express service is also available. Couriers will NOT deliver to a PO Box address. Couriers require a full street address (eg. 43 County Rd 35, RR#2). If you would prefer we ship your package by means other than Canpar, please contact us by phone or email, or indicate the preferred method int the “Notes” section at the end of the checkout process. We are unable to provide on-line shipping calculation for shipping methods other than Canpar, but they’re usually around $5.00 more. Shipments to PO boxes will be sent by Canada Post. Parcels can be sent to the U.S. either by UPS or by mail. Orders that weigh more than 1kg (2.2lbs) or cost more than $100 are best sent by UPS. UPS will not deliver to a PO Box address. UPS Standard deliveries usually costs around $22. UPS guarantees that packages sent this way will be delivered in under five business days (they often arrive much sooner). Faster service is also available. UPS may charge customs duty on orders valued over $200. Smaller packages can be sent by surface or air mail. Surface mail costs between $8 and $14 and takes between two to four weeks to arrive (sometimes longer). Air mail delivery costs between $10 and $16 and takes one to two weeks. Packages sent by surface mail to addresses outside North America may take four to six weeks to arrive. If you’d like speedier service, please request air mail. Express courier service is also available. Prices start around $65. All customers are responsible for paying their country’s customs duty charges if applicable. When you call or email us your order, we will calculate the total cost (including shipping and taxes) for you, and set aside your books or charts. When we receive your personal cheque or International Money Order in Canadian dollars (made payable to The Nautical Mind), we will ship your order. Residents of Canada will be charged charged 5% GST/HST on books. Residents of Ontario, New Brunswick, Nova Scotia, British Columbia, and Newfoundland and Labrador are charged the appropriate HST rate (12%-15%) on non-book purchases such as charts and software. If you are not completely satisfied with the books you purchase, we will fully refund your money if you return them to us in good condition within two weeks. We do not accept any returns of software, DVDs, charts or, professional texts (including ebook .EBKs). We accept customer reviews of books and post them with the title’s online listing. By submitting a review, you agree to let us republish it royalty-free in any medium. We reserve the right to reject offensive or inappropriate reviews. 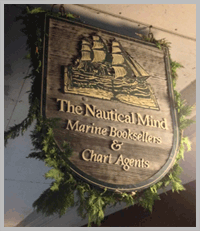 Thank you for ordering from The Nautical Mind. As an independent specialized bookstore, we appreciate your business!